Order our Latest Issue in PDF form (or any issue #57 - #115 + #1, #6, #7, #8, $10, #11, #16, #17, #31) by e-mail, only $5.00 anywhere in the world! 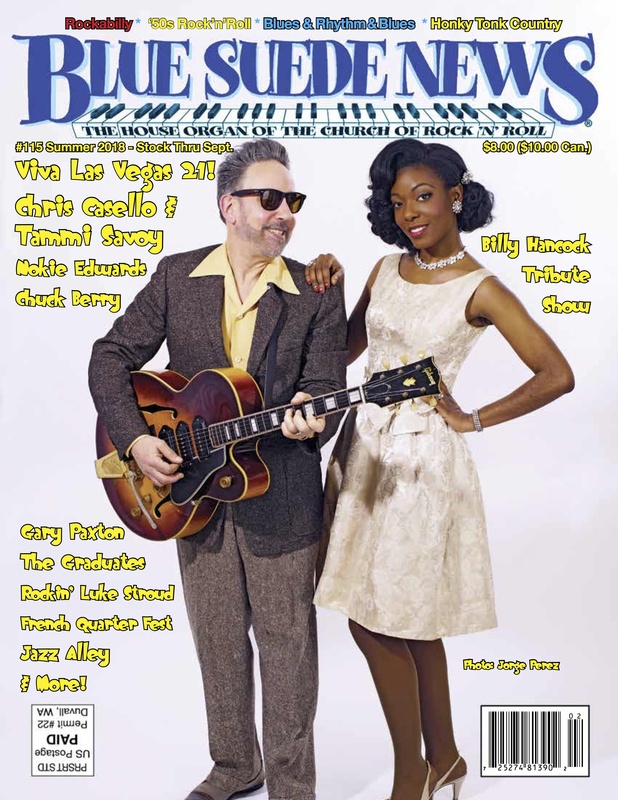 Blue Suede News #115 has a cover story/interview on new act Tammi Savoy who sings with veteran guitarist Chris Casello's Combo, plus a pictorial and story on Viva Las Vegas 21, where they previewed the new act in Chris' set. We have story on Gary Paxton (part 1), who began with Skip & Flip and later produced hit records like "Aley Oop" and "Monster Mash," among many others. We also have stories on piano rocker Rockin' Luke Stroud, Buffalo Doo-Woppers The Graduates, a tribute to the late Nokie Edwards and an interview with Jimmy Marsala, who wrote a book about his many years backing Chuck Berry. there's a pictorial from the French Quarter Fest and anotherfrom a Billy Hancock Memorial concert. Our regular features Tidbit Jukebox, Killer Bees and Thrift Store Score are also here along with our extensive reviews section covering Books, DVDs, CDs and Vinyl! Send $7.00 (U.S., $9.50 Canada), or $10.00 (Outside the U.S. and Canada) and note which issue you're buying - to Blue Suede News, Box 25, Duvall, WA 98019-0025 U.S.A.